Y'all know I'm all about simple. Right? Y'all also know how passionate I am about fueling my body with the most nutritious foods. Right? Whatdya get when you combine simple + healthy? Well...if you read the title of this post, you would know you get a Kale + Cranberry Salad... and it's literally...as easy and delicious as it sounds. 5 years ago, you could have handed me a bunch of kale and I would have never known what it was. I would have tasted it and hated it and never wanted it again. 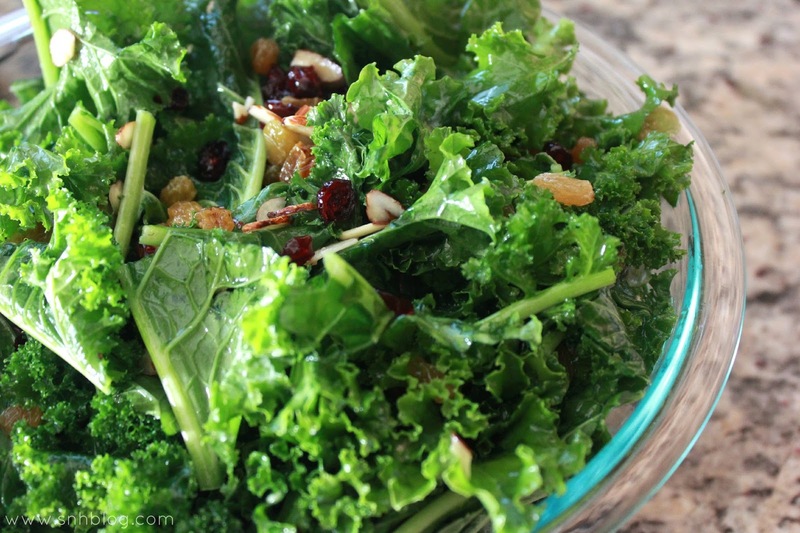 In fact, you probably couldn't have paid me to actually eat kale and pretend to like it. Fast forward to now. Obviously...I know what kale is but more so, I've learned just how beneficial kale is to your health and also, ways to actually enjoy it! Highest antioxidant capacity of all the greens. Antioxidants fight free radicals (the bad, cancer-causing stuff). Excellent source of vitamins A ("A" for awesome for skin), C ("C" for collagen-builder and immune booster) calcium (bone builder), carotene and lutein (both excellent nutrients for the eyes and for reducing the risk of macular degeneration). Rinse your kale and cut it into about 2 inch pieces. Toss the thick, veiny base of the stalks. Ain't nobody got time fo' dat. 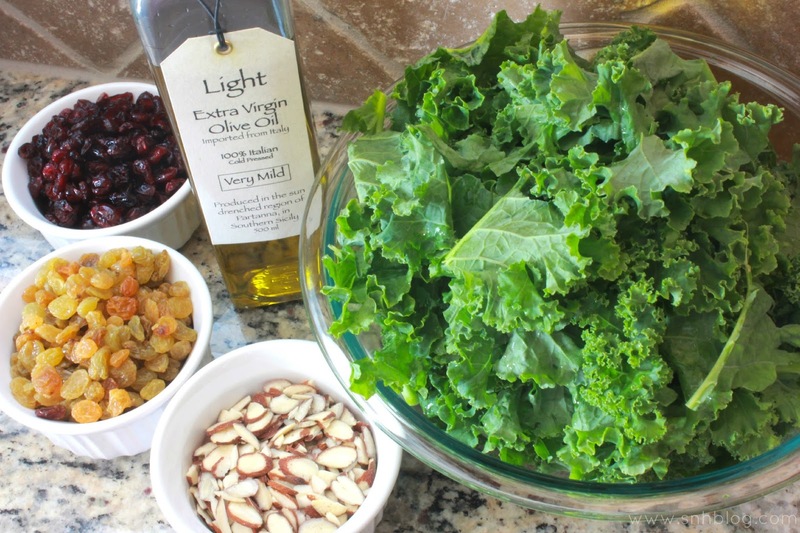 Find the largest bowl in your house (seriously...my kale was so fluffy I thought I was going to have to resort to using my bathtub as my mixing bowl) and combine all ingredients. If you're a fan of lemon juice and/or sea salt (raises hand), feel free to add a little to your mix. It's not completely necessary but sometimes I need a little somethin' somethin' to lessen the taste of the olive oil. Lemon juice and sea salt do just that! 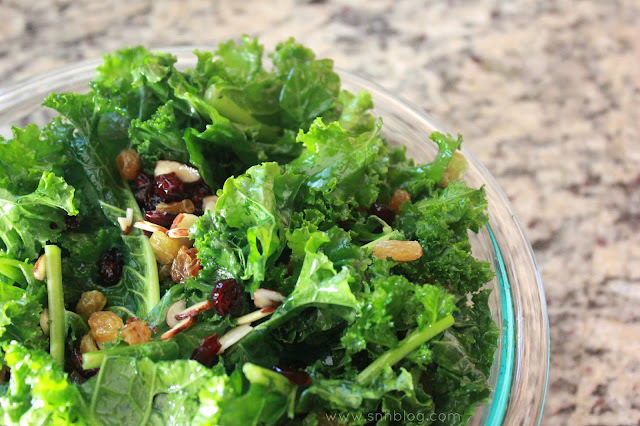 Toss yo' salad and just like that my friends...you have just made your very first Kale + Cranberry Salad! Refrigerate for at least 30 minutes before serving because, afterall, who wants a hot salad?